If you signed up for summer school you have been enrolled – we had space for all students who submitted applications. Last day of school is tomorrow! 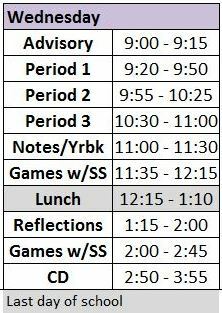 We have school from 9am to 3:55pm – schedule is pasted below. See you tomorrow for the last day of the year. Families – some of you received an incorrect message from enrollment about not coming back next year due to relocation. That message was sent in error, and we apologize for the glitch that sent this automated message out. We are looking forward to have you all back at DVC next year, so you can completely ignore this message! Here is the schedule for the last week of the year. Sophomores and Juniors – we will be looking into career pathways and selecting pathway elective classes tomorrow. Ninth graders – you will be taking the physical fitness test tomorrow – remember to bring running shoes and shorts/pants. Here is the 2016-17 School Calendar. The first day of school is Tuesday, August 16, and we’ll see you all then! Many people have already signed up for summer school – we’ll see you in a couple weeks! If you either want or need to take summer school, fill out this form here and sign up in the front office. We still have a few spaces in all classes.